This Saturday, we were enjoying the tail end of some not-too-hot-or-humid gorgeousness, so Al and I went out to play bocce with some friends. (In the group photo with me are Miss Lulu on the left and Dixie DIY on the right.) We’re all wearing entirely self-made! 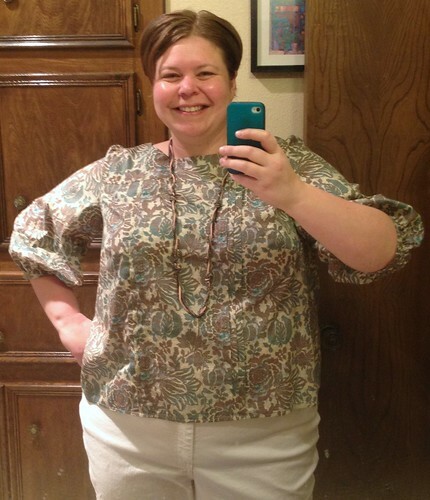 I’m wearing my linen top from McCall’s 5640, briefly discussed in this post. 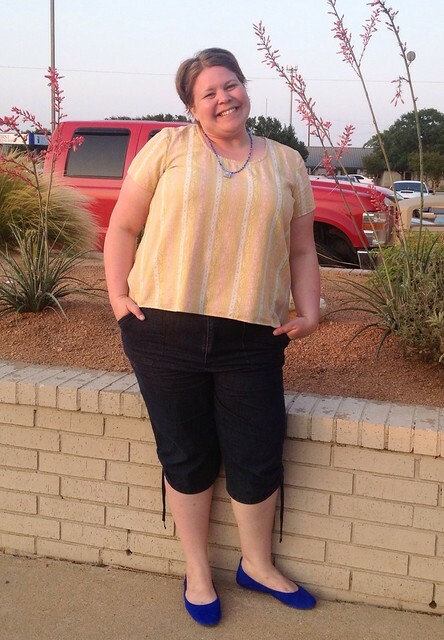 My pinstriped denim shorts are completely unblogged, made a couple of years ago from Simplicity 2258. 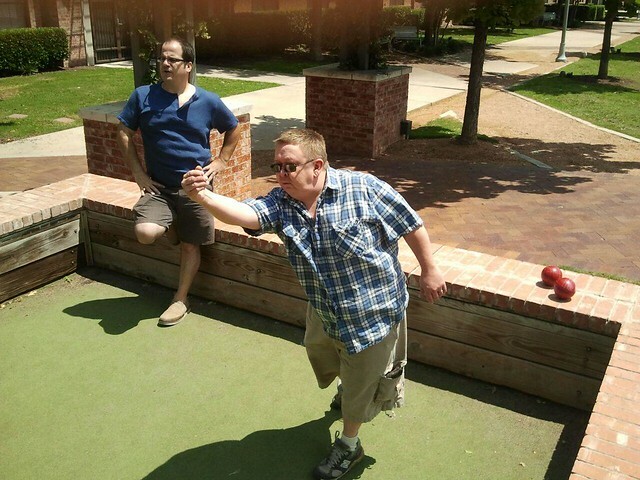 Oh look, more bocce players! Here is Miss Lulu’s man (left) and mine (right). Miss Lulu’s husband is wearing a top that she made him, but mine is all in ready-to-wear (RTW). He’s so hard done by. May 12 — I was sewing like a crazy sewing woman most of this day, so generally I was wearing as little as possible. I suppose there’s inherent danger in this, but clothes slow down all the fittings, man! If you’ve imposed a no-repeats clause in your MMM vow, you know that there is that item that you reach for hesitantly, because if you wear it, it will not be at your disposal the rest of the month. In case it isn’t obvious by how much more washed-out this one is from when I first wrote about it, this t-shirt is that piece for me. If I manage to go the rest of the month without wearing it again, it will be the first stretch of that length since it was born. 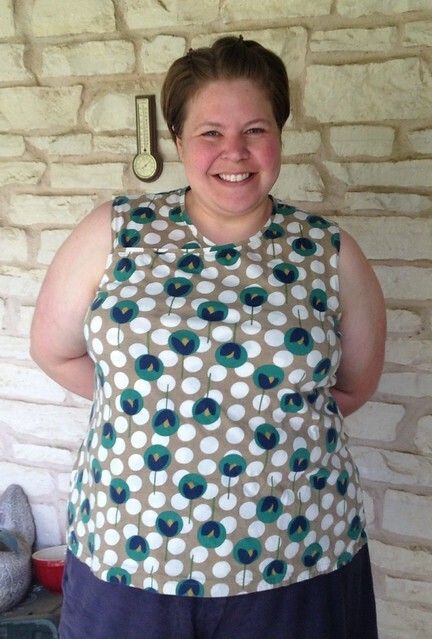 I blogged about this top a few months ago, planning to return to the pattern, but I haven’t yet! (I will though, at some point.) If you missed it, this is the first garment I ever made. Because of that, I will never get rid of it, but it doesn’t get worn much. May 16 — Apparently I skipped this day. 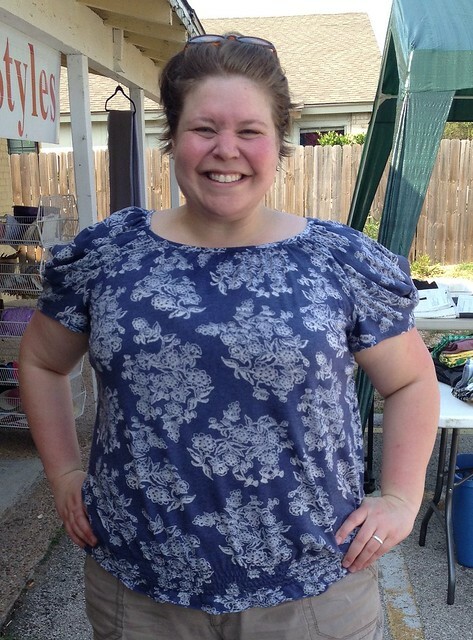 I never blogged this make, but it was made from a different view of the t-shirt pattern that I wrote about here. It’s a cute design, but see that little piece on my right shoulder? Yeah, it goes all the way down and across the front, to the hem… the front is fully double layered. Which would be great on a winter tee — you know, one with sleeves. Poor planning. I do like it though, and I like the print of the fabric. I need to do a little layer-ectomy on it and it will be juuuust fiiiiine. 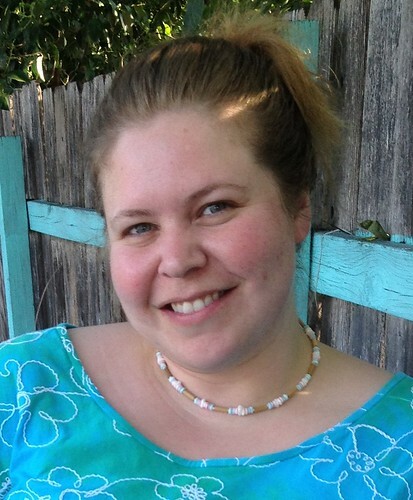 This top is a recent make, and its light weight was great for today, which was HOT and spent OUTSIDE. My local sewing group was hosting a stash sale, so it ended up being worth it because I have room on my shelves now. But did I mention HOT. I love living here, but I do have to remind myself of that several times per day during this time of year. Through September, at least. The majority of this day was spent outside again, working the second day of the above-mentioned sale, but I wasn’t wearing any new (not repeated) me-mades. This was what I wore when I went out for dinner. 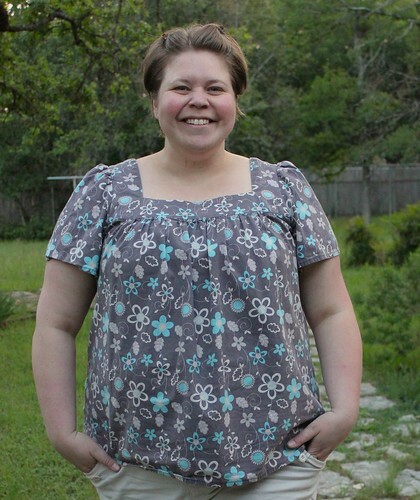 The top is an unblogged Scout, which I made because I hated the fabric and was sick of looking at it in my stash. I hoped I would like it more made up, which I often do, but it didn’t work this time. It’s still a Scout though, so those get worn. Until the day when I have plenty of them that I love in my closet… at which time this one will get the boot. May 20 — ??? No clue. You’re doing so well on your pledge! Yay for wearing me-mades! It’s been cool to see some of your earlier pieces. I really like that first one you ever made. The neckline suits you well. You should make some more of those. maybe even a couple sleeveless. Thanks sweetie — I totally need to pull that pattern back out, and make it with some drapier fabrics this time! Hey, you have a lot of cute stuff! And I like your unloved Scout top! Also, I couldn’t comment while I was gone because my phone is evil, but I ADORE your cobalt blue flats! AND: how can you treat your husband that way, LOL! Make the man a shirt! 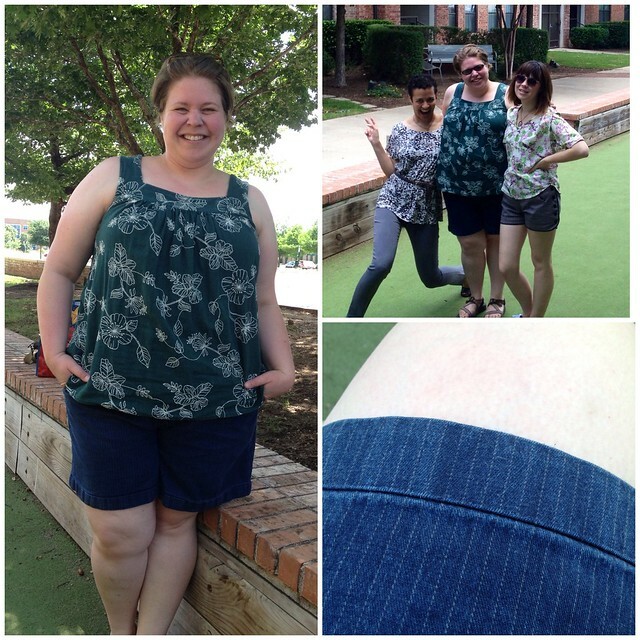 You’ve got some great tops there – love those shorts too. Thank you BeaJay! I’ve meant to return to that pattern too. I have some fitting things I want to tweak on it but it’s a good, easy pattern, and I need some more shorts! one more day! great job thus far! you have some really great tops! 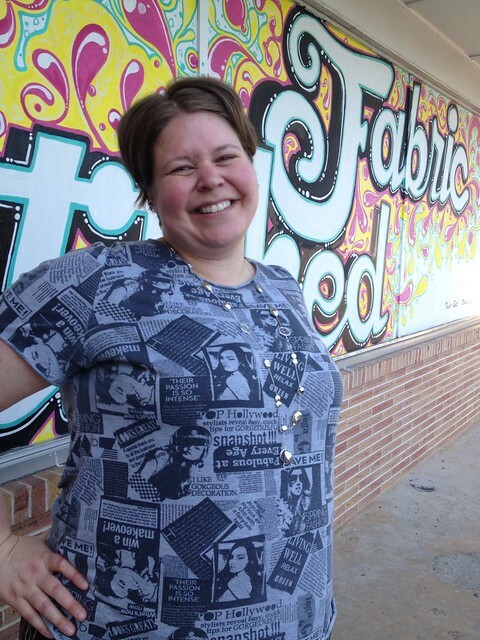 i saw the same print you used for may 19 at fashion fabrics club, but in a cotton lawn (and i think a different colorway). maybe you could stitch through both layers at the overlap then cut out the extra layer? at any rate, great job on MMM! Yes, that’s where I got it. I really love the feel, and the content — it’s a loose weave cotton/linen blend, but it’s the colors I don’t like for me. And that’s a great call on what to do to that May 17 one…stitching through at the overlap would be good. Soon. :) Thanks Lisa! Amazing tops… you are so inspirational!!! Love your page! Aw, thank you so much! MMM has definitely been an educational experience for me!